You are currently browsing the category archive for the ‘common birds uniquely designed’ category. An Egret is a common bird with a comical gait and a splendid posture that is unique among feathered friends. There have been a number of times when I was comfortably enjoying the woods and a pond. Then, the sound of fluttering wings gave notice to an Egret landing in the water. Its long legs would slowly and carefully lift, stretch and walk into a better position. Then it would crane its neck, adjust its posture and tilt its head. When the sun, water reflection and shadows were just right a special event was about to take place in lightening speed. The bird would strike. Its beak and head would dart into the water. Very little splashing would follow. Like an expert in spear fishing, the Egret would emerge with a tiny minnow in its beak. Carefully, it would lift up its head and lean back at just the right angle, manipulate its catch, and swallow it whole. Then, it was back to fishing again. It is a graceful bird. When it functions it is clear that it has a flexibility which serves it well by the Creator’s design. This is another creature of creation that makes far more sense as an intentional design rather than a happen chance result of trial and error. 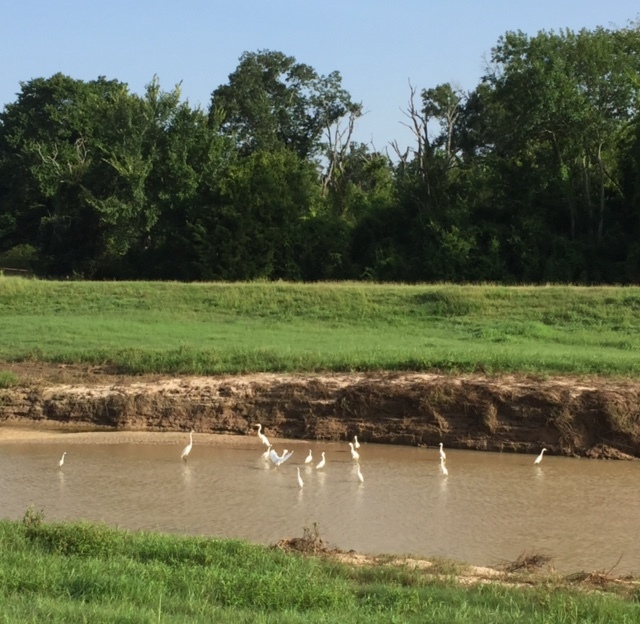 On a bike ride through the George Bush Park in Katy, Texas I chuckled at these funny birds. Usually, I see them by themselves. One bird fishing a territory of water. This time there was a whole convention of birds. I was far enough away that they did not spook. Instead, they went about bathing, chattering to each other or fishing for food. Some had their heads up looking for danger. Others took on a posture as if spoiling for a fight. Maybe it was a convention. Possibly like people this might have been a technique consortium on the best fishing techniques for the next generation of birds. Goofy thoughts made me chuckle. Funny birds made me chuckle out loud. Isn’t life grand when we can enjoy what we see, think lofty thoughts of theology and science, treasure the privilege to watching wildlife teach us about life? Don’t you agree that this is quite a fascinating bird?